MORE PHOTOGRAPHIC PROOF CAVITIES HEAL | "Global Possibilities"
It is very disturbing that most conventional dentists still insist that a cavity cannot heal on its own when proper nutritional support is provided and detrimental foods to oral health removed from the diet. Of course, Dr. Weston A. Price DDS, a prominent, well respected dentist early in the last century who used to be President of the National Dental Association (1914-1928), the forerunner of the American Dental Association, wrote about cavities healing with diet on numerous occasions in his nutritional classic Nutrition and Physical Degeneration. Why has this information been so completely buried and villified in recent decades? Perhaps it is the profit motive that keeps most dentists from acknowledging this truism of oral health. Why dentists might be concerned about their business evaporating if this information became widely acknowledged is short sighted, however. I mean, even if dentists promoted to their patients that cavities heal and assisted them with the appropriate dietary intervention when necessary, there still would be plenty of drill and fill business for them from caries that did not resolve from diet alone due to food intolerances or genetic issues known to impact enamel formation. Dentists that choose to insist that diet only impacts the formation of cavities, but not whether they heal are doing their clients a huge disservice. “These discolored, remineralized, arrested caries [cavities] areas are in-tact and are more resistant to subsequent caries [cavity] attack than the adjacent unaffected enamel. They should not be restored unless they are esthetically objectionable.” – Sturdevant’s Art & Science of Operative Dentistry 4th Edition, 2002. From a consumer perspective, more and more parents are realizing the power of diet to arrest and heal cavities, and they are starting to photograph it to prove their case. The first article I published with photographic proof that cavities heal can be found here. Kristin S., a mother in New York then consented to the use of her own series of photographs of her child’s cavities healing over a period of six weeks. The discoloration and holes in the teeth were identified as actual cavities by the child’s own dentist prior to the healing diet being commenced. The photos are taken at week 1, week 3, and week 6. Click here if you would like to see the specific dietary changes and recipe for the natural toothpaste that Kristin used with her 3 year old son. 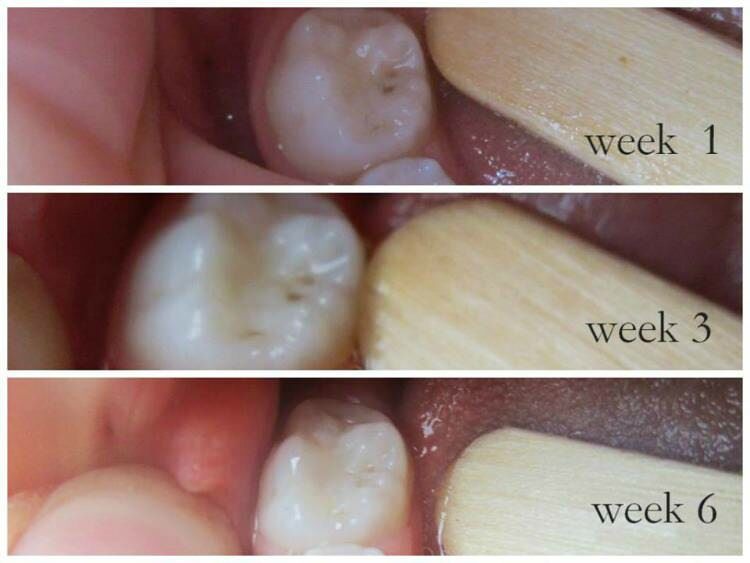 As you can see below, the discoloration in these cavities remarkably disappears over a six week period and the holes in the enamel begin to fill in. These results are impressive and very encouraging for those parents who keep their children’s teeth meticulously clean only to still experience tremendous problems with cavities. Let’s keep the heat on the conventional dental establishment by sharing with each other our successes as parents in resolving our children’s cavities! Need the whole story about diet healing cavities?